Pedestrians in Spain could soon be breathalysed and made to obey speed limits in proposals by officials hoping to make the country’s streets safer. The plans have sparked a dispute, with the government’s top advisory council calling it a violation of Spaniards’ rights. Earlier this year, Spain’s Directorate General of Traffic, the government body responsible for managing traffic, proposed a new “tool to foster better relations and coexistence between pedestrians, cyclists, motorists and vehicles”. Tucked between suggestions for increased fines for drunk-driving and better regulation of driving schools was a change that would define pedestrians as “users of the road”, putting them on a par with drivers. Pedestrians could be required to take on-the-spot alcohol and drug tests if implicated in a traffic accident or traffic offence. The proposal also sets out a speed limit for pavements, limiting the pace to “not surpassing that of a normal stride”. The Council of State, the government’s top advisory council, in a report seen by Europa Press, urged the government body to overhaul the proposal. The measures would hinder the freedom and personal privacy of Spaniards as well as their right to circulate freely, it said. Spaniards, continued the report, “could possibly abstain from fiestas or from attending weddings and celebrations where alcohol is consumed, since they could be subject to an alcohol test if a vehicle near them is involved in an accident”. 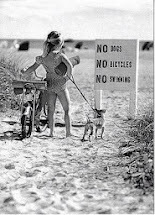 As for the speed limits suggested for pedestrians, the report worried it would amount to a “prohibition on jogging”. If it saves just one life, etc. And the UK is not far behind. The rise in childhood obesity, which has left one in three UK children overweight, may be beginning to level off in the under-10s, a study suggests. Regular readers of this blog will know that it's not beginning to level off. In fact, it's not just levelling off. It's falling and the fall has been going on for more than a decade, at the same time as the hysteria about the younger generation 'dying before their parents' has become the conventional wisdom. The first line of the BBC article uses the old trick of conflating obesity with overweight, but even if you combine the two measures there has been a clear decline in the last decade. 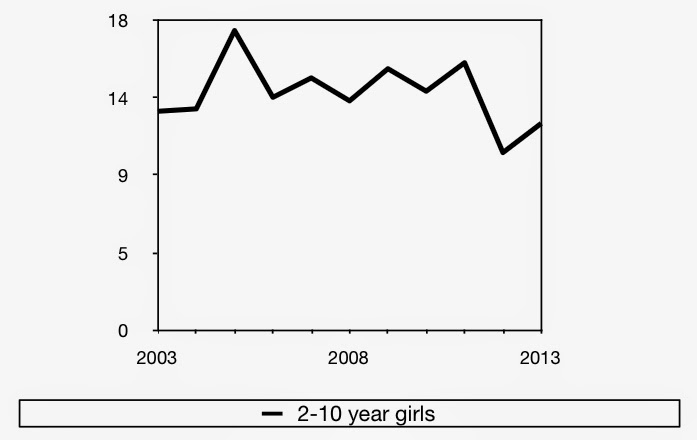 Overweight + obesity peaked at 31.9% amongst 2-10 year olds in 2005 and has since fallen to 25.6%. 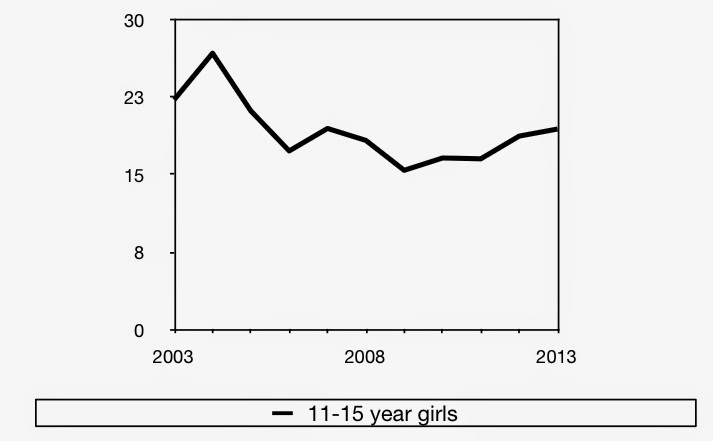 For 11-15 year olds, it peaked at 25.5% in 2004 and has since fallen to 19.9%. It is simply untrue to say that 'one in three UK children [are] overweight'. The BBC article is based on a new study which comes up with different figures from those of the ONS. 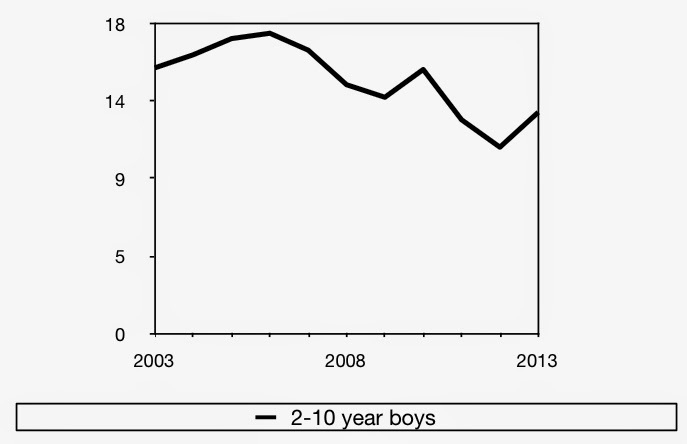 Although it says that obesity/overweight has flatlined amongst 2-10 year olds, it claims that rates have continued to rise amongst 11-15 year olds. Personally, I'll trust the ONS until I'm given a good reason not to. Either way, the hysterical predictions are looking very shaky. The timebomb never went off and it was never going to. It took years for the BBC to acknowledge that alcohol consumption was in decline from 2004 onwards. Could today's report be the start of the corporation coming to terms with the obesity epidemic not panning out in the way that was predicted? Don't forget that it is only twelve months since we were told that the obesity 'epidemic' could be 'much worse than predicted'. We were told that 25 per cent of children would be obese by 2050. In fact, childhood obesity has fallen from 17.4% in 2002 to 15.2% in 2013. Can someone explain to me how a demonstrable decline is worse than a predicted rise? Shouldn't the soothsayers of public health be downgrading their predictions in the light of real world evidence? Or could it be that obesity forecasts are never intended to have any predictive power and are only devised to scare the public into accepting illiberal laws? Support for PP [plain packaging] increased significantly after implementation (28.2% pre vs 49% post), such that post-PP more smokers were supportive than opposed (49% vs 34.7%). Although it seems trivial, there was a subtle shift in survey methodology after plain packaging came in. The Tobacco Control researchers asked a slightly different question to smokers after plain packaging was in force. ‘Tobacco companies should continue to be required to sell cigarettes in plain packages, as they are now’. The difference seems insignificant at first glance and, given the context, the rewording seems reasonable. But the wording of the questions had more of an effect than you might think. Shortly after the Tobacco Control paper was published, the research agency Povaddo conducted a survey in which 500 smokers were asked the first question and 500 smokers were asked the latter question. Of those who were asked the first question (‘Tobacco companies should be required to sell cigarettes in plain packages—that is, in packs without the usual brand colours and symbols, but keeping the warning labels’) 24 per cent agreed and 46 per cent disagreed (the rest were indifferent). Of those who were asked the second question (‘Tobacco companies should continue to be required to sell cigarettes in plain packages, as they are now’) 31 per cent agreed and 36 per cent disagreed (the rest were indifferent). This is quite a swing and it is interesting to speculate on why opposition to plain packs eased off by ten percentage points when respondents were referred to packs 'as they are now'. The most likely explanation is status quo bias, possibly combined with the bandwagon effect. It seems that the wording of the question in the Tobacco Control study was more important than it appeared. Even without any change in smokers' attitudes towards plain packaging, the wording ensured that they would appear to be less hostile to the policy. But there is another big difference between the two surveys which cannot be explained by the wording of the questions. In the Povaddo survey, a relative majority of both sets of smokers were against plain packaging. The most it could manage, using the second question, was 31 per cent in favour and 36 per cent against (as opposed to Tobacco Control's 49 per cent in favour and 35 per cent against). Proximity of intention to quit (no intention or beyond 6 months/within the next 6 months). Realised health damage (‘To what extent, if at all, has smoking damaged your health?’ : not at all, just a little, a fair amount, a great deal). You will have noticed that all these questions refer either to quitting smoking or to the negative health effects of smoking, thereby framing the question about plain packaging in a context in which any tobacco control policy might seem more reasonable. It is not clear from the text of the Tobacco Control study whether these questions were asked before or after the plain packaging question, but if they were asked first—and I'll bet you a pig to a pork scratching that they were—then this framing, combined with the changed wording of the post-implementation question, explains why the Tobacco Control researchers got a response that was more to their liking than the more neutral Povaddo survey. Earlier in the month I wrote an article about soda taxes for Cato Unbound (spoiler: I'm against them). It has now had three full length responses, from Baylen Linnekin, Russell Saunders and Jennifer Harris. Baylen (an attorney) agreed with me, Russell (a paediatrician) partly agreed with me but still wants to see taxes on soft drinks, and Jennifer (a social psychologist) mostly disagreed with me and wants to see tobacco-style polices for food. 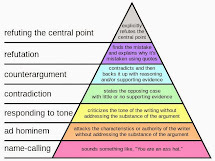 Firstly, I should say that I do not hold some of the opinions that Harris and Saunders consider to be truisms. Saunders says ”that obesity is a major U.S. public health problem is not a subject of much dispute” while Harris says that “All agree that parents cannot solve the childhood obesity crisis on their own.” In fact, I do dispute that obesity is a “public health problem.” I don’t share the currently fashionable view that a public health problem is merely the aggregate of a nation’s private health problems. Obesity differs from genuine public health issues, such as unclean drinking water, pollution, and tuberculosis, in that it is not infectious and it can be prevented and cured without government intervention. It a private health problem – or, more correctly, it is a risk factor for private health problems. I am loath to start a sentence with the words “as a parent,” but as a parent I reject Harris’s assertion that “parents can’t compete with the overwhelmingly unhealthy food environment surrounding their children as soon as they step outside the front door.” Parents can prevent their children becoming obese, particularly when they are young. Collectively, therefore, parents can “solve the childhood obesity crisis,” if it must be put in those terms. Similarly, parents can prevent themselves from becoming obese. The evidence is all around us. Even in the United States, with its supposedly “obesogenic” environment, two-thirds of adults and 83 percent of children are not obese. Obesity is not rare enough to be called deviant, but nor is it normal enough to be viewed as an unavoidable consequence of forces that are beyond the individual’s control. In a free society, the question of whether government should introduce legislation to tackle obesity does not depend on obesity being a “pubic health problem” or even a “crisis.” Intervention can only be justified if obesity results from market failure or creates negative externalities for those who are not obese. Harris suggests that both criteria have been met. She uses what is essentially a market failure argument when she talks about the need for “widespread systemic changes to the food environment.” The implication is that consumers are denied real choice because so many products contain sugar, salt, and fat. This is the famous “obesogenic environment” in which healthy choices are supposedly difficult, if not impossible, and consumers are unable to satisfy their latent desire to eat cabbage and broccoli. But look at the choices on the shelves, even in inner cities. There have never been so many low-fat, low-sugar, and low-calorie options in stores and supermarkets, never so many fruits and vegetables from around the world. You need look no further than the soda market to see the range of options available to the weight-conscious consumer. The Coca-Cola company launched its first low sugar brand (Tab) in the 1960s, and it now produces Diet Coke, Coke Zero, and Coke Life. Diet Coke and Coke Zero contain no sugar, and Coke Life is a low calorie version of Coke, made with a combination of sugar and sweeteners. Nearly all soft drink companies produce similar low-calorie, zero-calorie, and sugar-free varieties. All are widely advertised and all are available on the same shelves, in the same stores, and for the same price as their more sugary cousins. It is very difficult to argue that consumers are nudged, let alone coerced, into buying the high-calorie variants. If they buy them it is because they want them. I wrote an article for The Telegraph last week about the public health lobby's 'scream test' and the real motives behind plain packaging. So much for evidence. With every indicator showing that plain packaging in Australia has been, at best, a damp squib, the campaign for this risible policy was won with the one oft-repeated question: "Why would the tobacco industry spend so much time and money lobbying against plain packaging if it didn’t work?" Will plain pack campaigners put their money where their mouth is? I don't know if you heard, but Britain's government of nominally conservative and liberal politicians gave the green light to plain packaging this week. The vote in parliament will be a formality. The surprise announcement on Wednesday night was the culmination of several years of intense campaigning which swallowed up millions of pounds of taxpayers' money and yet the idea remains as futile, silly and counterproductive as it was when I first wrote about it six years ago. More so, in fact, because we have since had real world evidence from Australia proving its ineffectiveness. The campaign has gone on so long that I suspect the public will expect to see real results this time. It won't be like graphic warnings or the ban on cigarette vending machines, when legislation was pushed through quickly and then forgotten about. The public health lobby has an aversion to assessing its policies in retrospect for obvious reasons—most of them don't work. 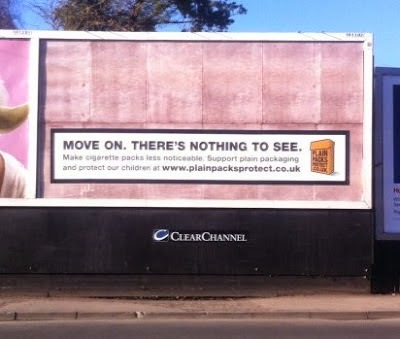 As I have said many times before, tobacco control is not a results-driven business, but the claims about plain packaging have been so hysterically overblown that I don't think the public will forget them overnight, no matter what fresh campaign is launched to take our minds off it. We have been told, by none other than the corpulent 'public health' luminary Martin McKee, that the best way to tell if an anti-smoking policy is effective is to watch the markets. We are also told that plain packaging is a bigger deal in the UK than it is in Australia. We have a larger population and we are regarded as more influential to copycat nations in the West than distant Oz. 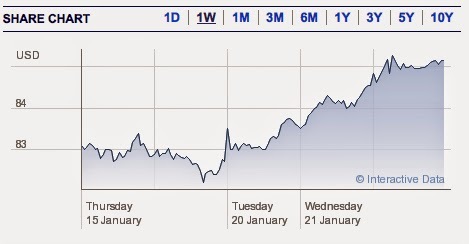 So how did the markets react to the seismic news this week? ASH et al. have committed a lot of money to the idea of plain packaging in recent years, most of it belonging to taxpayers. Would they, I wonder, bet their own money on the policy working? Because the people who actually do have money in the game are calling their bluff. "Our end game is to bring sugary fizzy drink consumption down to zero in 2025, similar to the end game for tobacco consumption." See this post for a reminder of who these advocates of "stopping the availability of sugary drinks in New Zealand" are, and see Feminoptimal for further comment. For children aged ten years and under, the main sources of NMES [non-milk extrinsic sugars] were ‘non-alcoholic beverages’ (27-30%) and ‘cereals and cereal products’ (25-29%). For children aged 11 to 18 years, ‘non-alcoholic beverages’ was the largest contributor to NMES intake, providing 40%, mainly from soft drinks (30%). 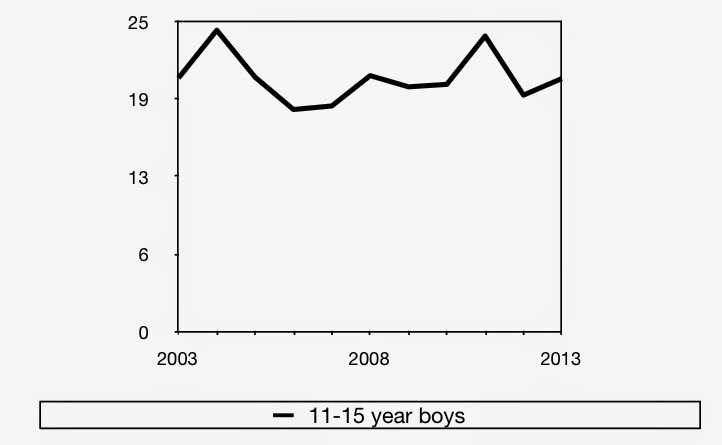 ‘Fruit juice’ contributed 10-14% to NMES intake in children across the age groups. 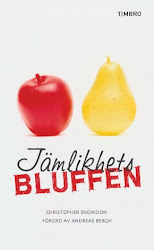 ‘Sugar, preserves and confectionery’ contributed an additional 19-22% to intake for children. The appendix shows the % of sugar that comes from fruit juice and soft drinks in detail (click to enlarge). Call me a pedant if you must, but I've always been under the impression that a majority is any percentage above 50 per cent, and that figures like 27 per cent, 30 per cent and—if you count fruit juice as a 'sugary drink'—40 per cent are known as a 'minority'. Never mind though, eh? Fenton only relieves the taxpayer of £175,000 a year to do this job. For the record, here's what the other tireless public servants at this quango get paid..
Oxfam have been given lots of news coverage today thanks to a report which claims that the richest 1% will 'control' more than half the world's wealth by 2016. 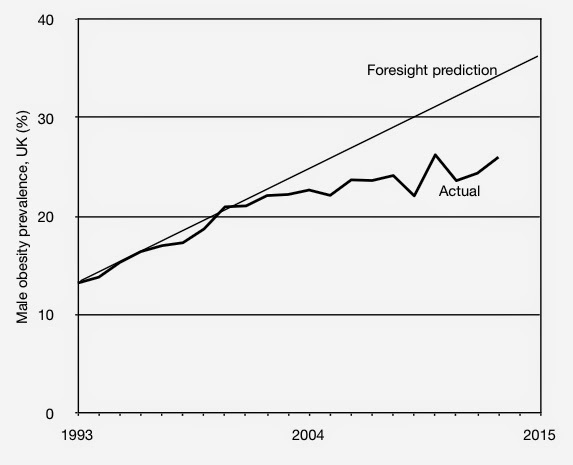 The prediction is based on this graph (from page 2 of their report). The weaknesses of this extrapolation should be obvious, although they seem to have eluded the BBC, The Guardian et al. 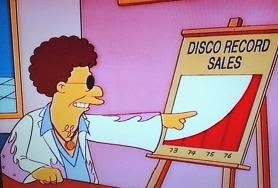 Oxfam cherry-picked four years of data and drew a straight line extending out from them. And, just to be sure of getting the right result, they ignored the most recent year, presumably because it suggests that the trend is flattening out. 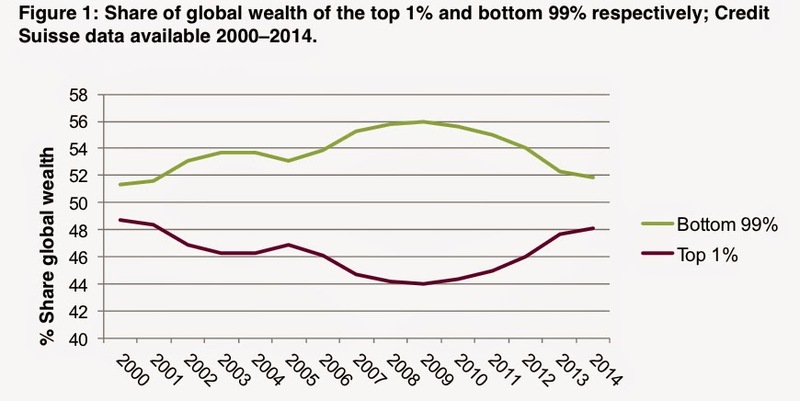 The idea that the 1%'s share of wealth rises in a straight and linear fashion (because of Global Capitalism - boo!) is a fiction. One only needs to look at the other graph on page 2 to see this. 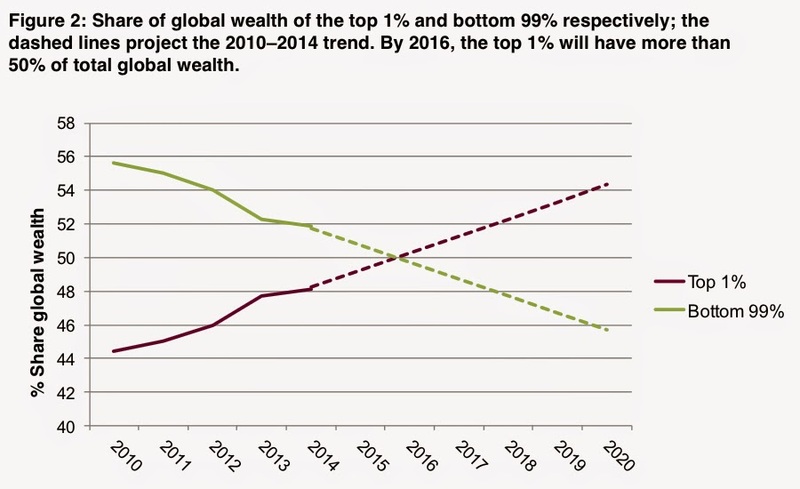 The 1%'s share of wealth may now be about to fall again, or it may stay flat, or it may rise. Without an understanding of why it fluctuates in the first place (which Oxfam, being economically illiterate, does not have), it would be foolish to speculate. But what you really should not do is cherry-pick a handful of years when the share of the 1% rose and assume that this trend will continue inexorably. The extrapolation of current trends, which underpins the microsimulation, indicates that, by 2015, 36% of males and 28% of females will be obese. By 2025, these figures are estimated to rise to 47% and 36% respectively. By 2050, 60% of males and 50% of females could be obese. To state the obvious, it is now 2015. Are 36 per cent of British men obese? Well, we can't say for absolute certain because there is a peculiarly large delay in getting these figures out, but the most recent data go up to 2012 and I doubt that I am leaving a hostage to fortune by confidently saying that they are not. Not even close. The obesity rate for men in 2012 was 24.4 per cent, less than one percentage point higher than it was in 2007. 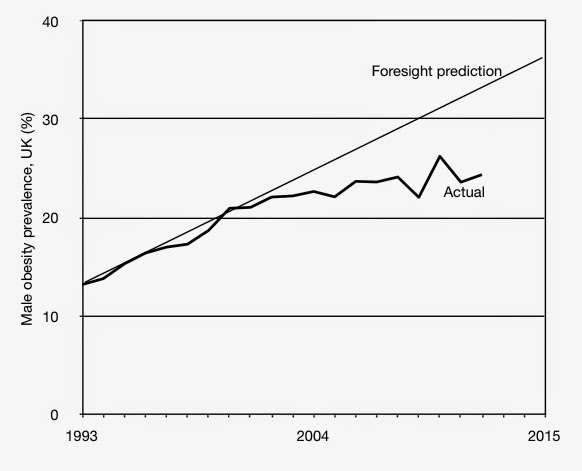 This is the Foresight prediction plotted on a graph alongside the actual data. You can see what the Foresight authors did here. 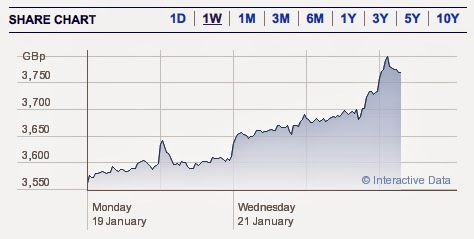 Rather like Oxfam, they found a trend that suited them (ie. 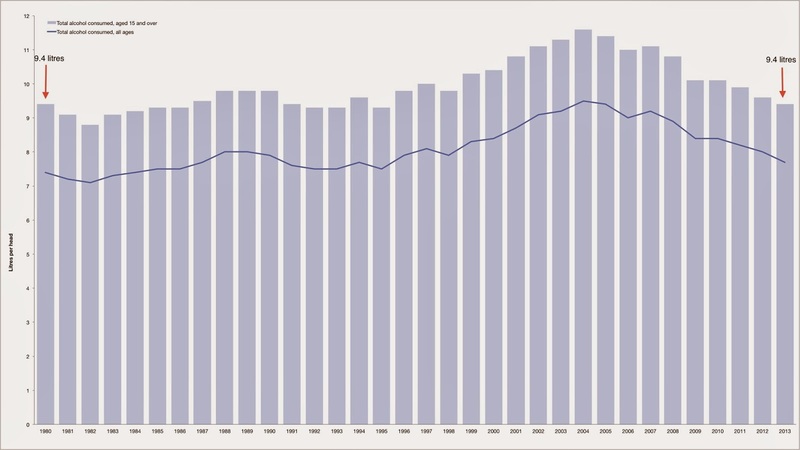 the 1990s), ignored the most recent data (they had figures going up to 2004 when they wrote the report) and extrapolated a straight line going ever-upwards. It is a mystery why the Foresight authors thought that male obesity would be so much higher than female obesity by 2015. Female obesity was higher when they wrote their report and it remains so today (although, of course, lower than they predicted: 25.1 per cent—and falling—in 2012). As with wealth inequality, there is no reason to think that rates of obesity will rise forever, let alone that they will rise in a straight line. But, as with Oxfam's report, the real aim of the Foresight report was not to produce a credible prediction, but to create alarming headlines such as 'Half of adults "will be obese by 2050"'. The Foresight report's conspicuous failure to make a vaguely accurate prediction of what would happen in five years time should cast serious doubts on their predictions of what would happen in 35 years time. Nevertheless, the claim that half of adults will be obese by 2050 continues to be made by campaigners for various taxes and bans. In 2011, the BBC stated as fact that 40 per cent of adults will be obese by 2030, based on an equally spurious extrapolation in The Lancet. It is also worth bearing in mind the fact that the Foresight predictions are the basis of many claims about the financial cost of obesity in the future. These cost estimates have already been shown to be highly inflated, but since the Foresight predictions of obesity prevalence have so far borne no resemblance to actual rates of obesity, they should be considered worthless. Finally, if you are thinking to yourself that obesity rates would have risen to the heights predicted in 2007 had it not been for the valiant effort of public health campaigners, remember that these very campaigners have accused successive governments of failing to tackle the problem. None of the policies that these people have campaigned for have been enacted and, according to anti-obesity industry, the government's Responsibility Deal has been "utterly inadequate" and "will not work". The inexorable rise of obesity predicted in 2007 has not been averted by 'public health' legislation. It was simply never going to happen. My thanks to Rob who contacted by e-mail to tell me that the 2013 figures came out last month (see here). They show that male obesity rose to 26 per cent and female obesity fell to 23.8 per cent. Taking both sexes together, the UK adult obesity rate was 24.9 per cent in 2013. In 2007, it was exactly 24 per cent. According to the Foresight report, it will be 32 per cent in 2015. If anyone would like to place a wager on this prediction coming true, I would be delighted to bet against you. When Labour announced yesterday that they would be aiming their public health rifles at tobacco, alcohol and sugar—rather than the traditional trio of tobacco, alcohol and obesity—it was a major win for Action on Sugar. Despite being barely a year old, this pressure group enjoys blanket media coverage and easy access to politicians. 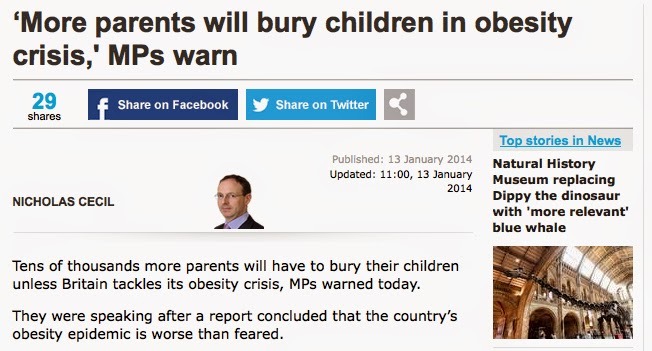 Last year, their representatives met with Jeremy Hunt to present their 'Childhood Obesity Action Plan'. They would certainly have delivered the same document to Labour health spokespeople like Luciana Berger. I only got around to reading it yesterday and I wasn't expecting much, but it is conisderably worse than I feared. In fact, it is an absolute disgrace. Time and time again Action on Sugar make hyperbolic and downright false claims that cannot be supported by their own citations, let alone by the wider scientific literature. It is scary to think that there are people in power who take them seriously. Here are some of the statements they make in this document, along with the references they cite. Obesity in childhood is strongly linked to the constant availability and consumption of ultra-processed foods and sweetened soft drinks(1). Source (1) cited here is Dietary Determinants of Obesity by Susan Jebb. This study doesn't discuss availability at all, nor does it mention 'processed' or 'ultra-processed' foods. For that matter, it only mentions children on two occasions, both of which I quote below. With regards to 'sweetened soft drinks', it says: 'Cohort studies show either no relationship or a positive association between sugar-rich drinks and weight gain or obesity in adults or children'. Hardly a 'strong link'. With regards to sugar, it says: 'While some studies show a protective effect of a high proportion of carbohydrate, many others show no association, particularly for studies in children [nb. sugar is a carbohydrate]. The evidence relating to the intake of sugar per se to weight change in inconsistent'. Again, hardly a 'strong link'. Indeed, barely even a hint of a link. Jebb concludes that the strongest link with obesity is not with sugar at all, but with fat, saying: 'The strongest evidence for an increased risk of obesity relates to diets that are high in dietary fat or low in fibre'. Not quite what Action on Sugar would have you believe, and yet they cite it anyway. From the outset, then, Action on Sugar totally misrepresent what researchers are saying in their own footnotes. These calorie-dense foods have no nutritional value, and are laden not only with sugar, but saturated fat and salt, leading to raised cholesterol and blood pressure, which further increases the risk of cardiovascular disease. It is unclear which foods they are talking about, but if they contain sugar and fat, they will have some nutritional value because - guess what - carbohydrates and fats are nutrients. You can just about argue that fizzy drinks contain 'empty calories' if you must, but you cannot say that food has no nutritional value just because you don't like the nutrients in it. If it is food, it has nutritional value by definition. Sugar that is added by the food industry is a major hidden source of calories in many foods and is an unnecessary source of calories that contribute directly to type II diabetes(2) and dental caries(3). Citation (2) is Dietary Sugars Intake and Cardiovascular Health by Rachel Johnson et al., published in Circulation in 2009. As the titles of the study and journal suggest, it is primarily about cardiovascular disease, not diabetes. In its eleven pages, it mentions diabetes just three times, most relevantly when the authors say that 'fructose consumption has been indirectly implicated in the epidemics of obesity and type 2 diabetes' (my emphasis). They say indirectly because too much sugar, like too much of any food, can lead to obesity, and obesity is a risk factor for diabetes. This is very different to Action on Sugar's heterodox theory that sugar somehow causes diabetes 'directly' even in people who are not obese. The difference between 'contributing directly' and being 'indirectly implicated' is massive in this context. Although fluoridation has a small impact, it merely delays the onset of caries, so that in the end all adults develop caries. Not all adults develop caries [tooth decay] and prevalence of caries has been falling for several decades. 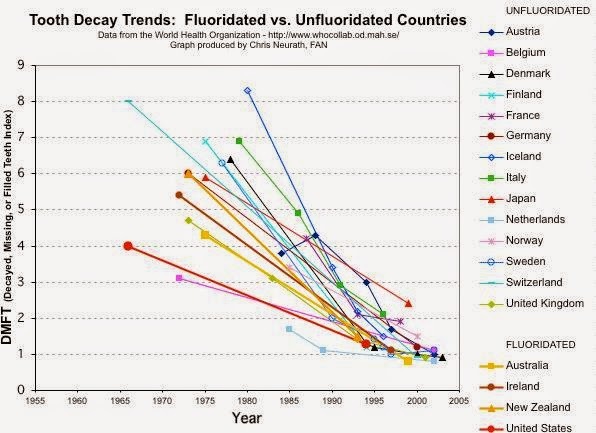 As the graph below shows, it is difficult to assess the impact of fluoridation, but fluoridation isn't the main weapon against tooth decay. Toothpaste is. Per capita sugar consumption has fallen in the last twenty years. The current policies such as the Responsibility Deal, where the food industry has pledged to reduce calories but can then decide what they do, has not had any effect on calorie intake on a public health scale. Calorie consumption has fallen in recent years, both for food eaten inside and outside the home. Whether this is due to the Responsibility Deal is another question. Nevertheless the sweetened soft drink and food industries are starting to acknowledge their role in causing the obesity pandemic worldwide, and also realise that it is entirely their responsibility to reverse it. Even the more hardened 'public health' campaigners acknowledge that personal responsibility plays at least some part in maintaining a healthy weight, both in eating and exercise habits. Claiming that 'Big Food' and 'Big Soda' are entirely responsible for making people slim - and, by association, have been entirely responsible for making people fat - is absurd. Removing 100kcal from the diet has been predicted to prevent the development of obesity and type II diabetes(4). Source (4) is a reference to the government's Healthy Lives, Health People policy paper (pp. 19-20). It says: 'A group of independent experts, chaired by Professor Ian MacDonald, has considered data on weight gain in England and advised that a reduction in energy intake of 100 calories per person per day on average would correct the energy imbalance at a national level and also lead to a moderate degree of weight loss' (my emphasis). Once again, Action on Sugar totally misrepresent their source. The policy paper does says not claim that a reduction of 100 calories a day would 'prevent the development of obesity' and it does not even mention diabetes in this context. It is widely accepted amongst the lay public and media that consuming more calories than we burn is the cause of the obesity epidemic, and thus the solution is to do more exercise. This is not correct. Obesity is due to eating too many calories, particularly food and soft drinks that give no feeling of satiety or fullness. Regular physical activity does have beneficial effects but there has been little change if any in our levels of physical activity in the past three decades, whilst levels of obesity has increased (12)(13)(14). This time we have three studies cited so there must be lots of evidence that activity levels haven't declined in Britain in the past three decades, right? Wrong. Source (12) is a study of Americans and so has no relevance. Source (13) is a BMJ editorial discussing a study which found that various interventions have failed to increase the amount of exercise children are taking in the last few years. The editorial notes that the study did not look at sedentary time 'which is emerging as an important risk factor [for obesity] across the life course'. Source (14) is a study of the energy expenditure of a hunter-gatherer tribe in Tanzania which found energy expenditure to be similar to that of a sample of Americans. As the NHS notes, although the study is of 'anthropological interest', it 'cannot answer the question of which is more important, a calorie-dense diet or lack of physical activity as a cause of obesity'. Naturally, the study says nothing about changes in activity levels in the UK in the last thirty years. In fact, there is plenty of evidence that day-to-day physical activity has declined in recent decades. Public Health England says that 'People in the UK today are 24% less active than in 1961'. There is also plenty of evidence that physical activity is important in body weight regulation. This really should not have to be explained to an alleged health group. A child eating a burger and chips, washed down with a sugary drink, followed by a bar of chocolate and crisps, would need to run half a marathon to burn off the calories consumed. If a child 'burnt off' every calorie he consumed through exercise, he would very soon be dead. Even a completely sedentary human being needs calories to survive. A ten year old boy needs 2000 calories to maintain a normal weight. If he runs half marathons, he will need a good deal more. ...the biggest cause of death and disability in the UK is due to the food we eat, through its very high salt, sugar and fat content, and the lack of fruit and vegetables. I'm sure the anti-smoking lobby and others would take issue with this claim. Only yesterday we were told that physical inactivity causes more deaths than obesity. Action on Sugar don't (or can't) provide a source for this claim, but I don't think it is too low a blow to point out that their science director, Aseem Malhotra, first came to my attention when he combined every death from heart disease, diabetes and cancer in the world and portrayed the total as being the number of deaths that are due to 'diet-related diseases'. I suspect he may have done something similar here. I could give more examples, but I hope my point has been made. This lobby group has an extraordinarily cavalier attitude towards evidence. They don't so much twist the facts as make them up as they go. Considering the folk at Action on Sugar have become the go-to people when the media want a soundbite about the white stuff, journalists really need to start doing some fact-checking. Just because someone has a 'Dr.' in front of their name doesn't mean they will necessarily tell you the truth. When the scientific director of an organisation that claims to speak with authority about sugar asserts that High Fructose Corn Syrup—a product that is practically non-existent in the EU—is 'added to almost all processed food' in Britain, you should be wary. When he claims that 'just one sugary drink, typical of a can of Cola, increases the risk of type 2 diabetes by 22%', you should be concerned. And when this same sugar 'expert' promotes notorious quacks, ignores peer-reviewers, sparks investigations at medical journals with his questionable use of sources and doesn't even know that fruit contains fructose, it might be time to find somebody else to talk to. The Labour party will announce its 'public health' policies for the general election later this morning. Judging by the press release, they will be much as we expected from the rumours of a 'nanny state crack down' last year. Andy Burnham seems eager for Labour to shed its reputation for interfering into lifestyles - he says he is moving away from the 'finger-wagging approach' - and yet he can't help himself. He 'will pledge to take tougher action to protect children from commercial pressures and the harm caused by alcohol, sugar and smoke'. Alcohol, sugar and smoke - the three horsemen of the apocalypse in a society that is scared of its own shadow. And all done, of course, for the sake of the chiiiiildren. Yawn. What is left to say about this ego-trip? 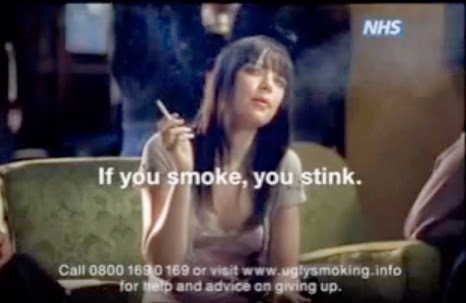 Millions of pounds of public money have been spent promoting it in recent years and yet it remains what it has always been—a desperate scrape of the barrel designed by anti-smoking zealots to irritate the tobacco industry and stigmatise smokers. People don't smoke because of the pack design and so there was never any chance that it would reduce tobacco consumption. Sure enough, when it was tried in Australia it didn't. Plain packaging remains on the agenda because everything else has been tried and politicians thinks it makes them look tough. Lord knows how this is going to work. How, for example, do you reduce the amount of sugar in sweets? They are, essentially, all sugar. You could replace the sugar with sweeteners, but that will only the stir the hornet's nest of cancer paranoia about aspartame and saccharin. Famously, this piece of government über-intrusion could end up with Frosties being banned. And why? If you - as a parent - don't want your child eating Frosties, buy them Corn Flakes. If you don't want them drinking Coke, buy them Diet Coke. In almost every food category you can think of, there are low-calorie, low-fat and low-sugar options. The market has provided. This is not about 'making healthy choices easier', as politicians would have you believe. It is about making tasty choices illegal. And don't let the reference to children fool you. If the government decides a product is 'marketed substantially to children', it's going to have its recipe modified by government. Bearing in mind that Labour thinks a cigarette pack constitutes marketing to children, the sky's the limit. Calorie, sugar, fat and salt content is clearly shown on virtually every food product you'll buy in Britain, but this isn't enough for the public health racket. Informing people was never the real goal. The true intention is to warn, deter and frighten off. It seems that Burnham/Berger are going to work with the EU to get 'traffic light' labelling on food. This has never been tried before, but the unintended consequences are blindingly obvious to anyone who understands human nature: people will make a beeline for food that has red traffic lights on it because it will very quickly become apparent that they are a guarantee of tastiness. This is rather vague, to say the least, but you will note that minimum pricing is not explicitly mentioned. Two months ago, Ed Miliband announced that he wasn't in favour of minimum pricing so perhaps the Labour party has got the message that it is unpopular, regressive and illegal. So what could they mean? Yet more taxes? Government-mandated small bottles? Banning white cider? We should soon find out. Of course, we do not want everybody to stop drinking. That is not the endgame. However, nonetheless, if we could just get the whole consumption curve shifted down by 10 or 20% - if we could get back to where we were in the UK, say, 30 to 40 years ago in our per capita consumption and we would see a huge benefit in health. You get the feeling that Gilmore would say he wanted to see the 'whole consumption curve' go down by 10 to 20 per cent regardless of where it stood at any given time, but he gives a more specific target when he says that he wants consumption to go back to where it was '30 or 40 years ago'. Gilmore doesn't seem to have kept up with the statistics. If he's happy with how much we were drinking '30 or 40 years ago' then he would surely be happy to split the difference and settle for where we were 35 years ago. Firstly, where is the 'huge benefit in health'? Secondly, now that Gilmore and his teetotal cronies have achieved their goal, will they go off, leave us alone and do something useful with their lives? The answer, of course, is that there hasn't been a 'huge benefit in health' because basing policy on the 'whole consumption curve' is a fool's errand and they won't go away because they are prohibitionists who are in it for the long haul. Twenty-five different cancer treatments will no longer be funded by the NHS in England, health chiefs have announced. NHS England announced the step after it emerged the £280m Cancer Drugs Fund - for drugs not routinely available - was to go £100m over budget in 2014/15. Some drugs will be removed and others restricted - a move charities say could leave some without crucial treatments. Liverpool PCT could find £400,000 to help put up 20 mph signs in residential streets and could find a further £265,000 to fund a 'program of community engagement work on slower speeds'. 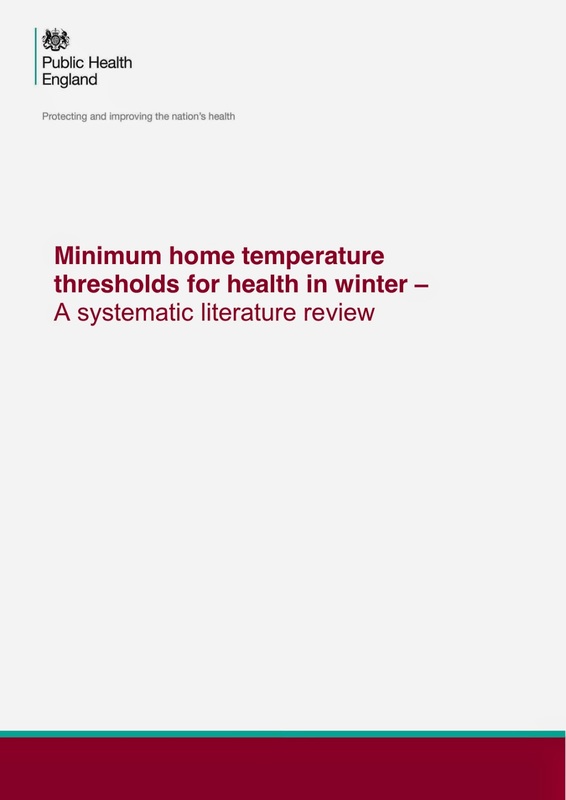 Public Health England, whose £600 million budget could fill the funding gap for cancer drugs six times over, found money to produce exciting new guidelines which recommended people heat their homes to 18 degrees Celsius (a radical departure from the previously recommended 21 degrees that we all used to abide by). PHE also called for health warnings to be put on till receipts if people bought 'too much' unhealthy food. The NHS managed to scrape together £46 million to spend on essential front-line roles such as ‘play and communication worker’, ‘carbon manager’, ‘car park environmental officer’, 'arts in hospital co-ordinator', 'EU office director' and 'green label development co-ordinator'. Very necessary. 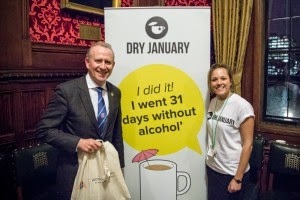 Public Health England found £500,000 to give pretend charity Alcohol Concern to promote Dry January, a campaign it had previously run without additional state support and which Cancer Research also runs in the same month. This was in addition to the £450,000 that Alcohol Concern also gets from the taxpayer. ... and, of course, the NHS found the money to tell some of the country's most heavily taxed people how much they loved them and appreciated their hard earned money. There was also plenty of money available to fund astroturf temperance groups like this and this. And other lobbyists like this. Or this, this and this. And there was just enough money to pay these muppets to go around city centres campaigning for a smoking ban in cars. But after all that expenditure, there naturally wasn't enough money left for trivial distractions like healing the sick. After all, people with cancer occasionally make a recovery without any treatment, whereas the nanny state would die tomorrow if it wasn't for taxpayers' money. Taxes on food and drink: Fair? Efficient? Effective? I have an article about sin taxes in the latest edition of Cato Unbound. 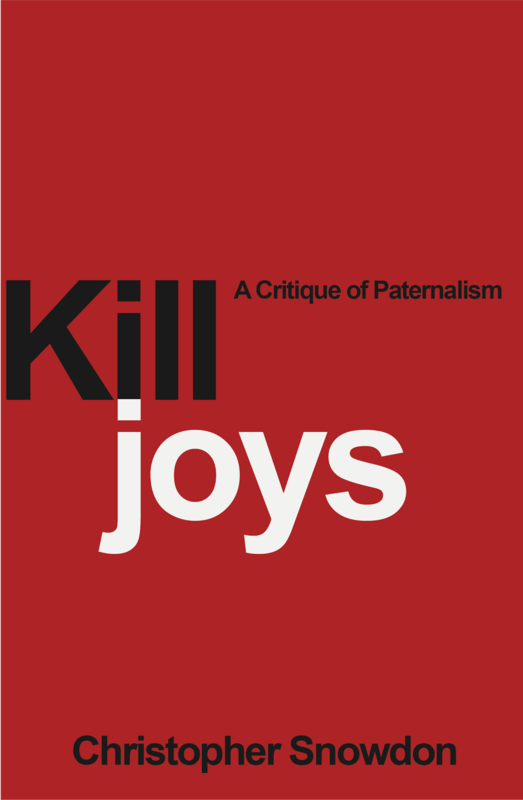 Over the course of January, other writers will challenge and debate the point I make. I, in turn, will respond. You can also make a contribution in the comments if you wish. Extending “sin taxes’” to certain foods and soft drinks is increasingly seen as a practical response to obesity and obesity-related diseases. Several countries and most U.S. states have some form of tax on soda, candy, and/or fatty foods, but they have so far had little or no effect on population health. For a tax to be justified, it should be efficient, fair and effective, and that taxes on food and drink meet none of these criteria. This tells you a lot about the mentality of the anti-smoking crusade. Consider the following scenario. You are deeply concerned about the effect of smoking on health. You've spent your whole career trying to help people give up smoking. You dream of a 'smoke-free world'. But it's a struggle. Smoking rates tend to be on the decline in wealthy countries, but they are falling very slowly. Globally, there are more people smoking than ever before and there will be more people smoking tomorrow. No matter how many bans you introduce, a large minority of adults continues to smoke. Tax rises have had some effect on smoking prevalence but—although you would never say so openly—you are aware that these taxes are a major burden on the poor and are fueling a large and growing black market. What's more, nearly everything has been tried. All the reasonable stuff—health warnings, anti-smoking ads, banning sales to minors—was introduced before you were born. Even the more extreme measures on the list have mostly been ticked off, which is why you've had to spend the last few years scraping the bottom of the barrel with this silly plain packaging campaign. But what comes next? It has to be prohibition of some sort, and you know that won't work. At one time, many years ago, it seemed that nicotine patches and gum might offer a solution, but it has become clear that smokers don't really like them and their efficacy as stop-smoking aids is pretty negligible. And then, out of nowhere, a product falls into your lap that smokers actually like and which helps smokers quit. Incredibly, even smokers who had no intention of quitting find themselves switching to it. There is no evidence that it causes cancer, heart disease or COPD and it doesn't create an odour that non-smokers would find objectionable. You can't believe your luck. This is the kind of thing that people like Michael Russell hoped to discover in the 1980s: a device that delivers nicotine in a satisfying way without delivering the smoke and the toxins. At last! This changes everything! What an opportunity! In scenario number two, you are a journeyman public health advocate picking up a nice, steady wage from the government every month. You hold lots of meetings and you go to lots of conferences. You and your colleagues developed a plan of incremental prohibition in the early 1980s and you have it all mapped out. The Plan was to ban tobacco advertising and then ban smoking in as many places as possible. You were going to raise taxes on tobacco until it became unaffordable for people on low and median incomes. Other ideas—display bans, graphic warnings, banning menthol cigarettes—could be incorporated if you could convince politicians that something should be done and these policies were something. You would attack what you considered to be the source of problem—the tobacco industry—with plain packaging, windfall taxes, standardised cigarettes or whatever. Gradually, you would beat smokers and the industry down until both were so unpopular that you could push for the final goal of prohibition. Within twenty years (it was always twenty years away) the tobacco industry would be outlawed and there would be no more smoking. In the meantime, there was good money to be made getting research grants to prove that the various policies in The Plan would work. And then something comes along that you didn't expect. A new product that gives smokers a way to enjoy nicotine without the health risks of smoking cigarettes. You didn't come up with the idea. The government didn't come up with the idea. It came from the private sector, and private businesses are making money out of it. Worse still, after a few years of monitoring the market, the tobacco industry buys up a few companies and now they're making money out of it. Sure, lots of people are giving up smoking as a result, but not in a way that was part of The Plan. Where does this leave you? What will become of the public health professionals and all their peer-reviewed studies? What about the 'endgame'? What a problem! "This was a problem we didn't have a number of years ago. It's a real frustration for those of us working in public health because it wasn't even on the horizon a number of years back." Islamic State's (formerly known as Isis) ban on cigarettes is one of its signature polices. It has imposed a strict set of Sharia laws barring the use of drugs, alcohol and cigarettes in the territories it has conquered across a swathe of Iraq and Syria. IS has declared smoking "slow suicide" and demands that "every smoker should be aware that with every cigarette he smokes in a state of trance and vanity is disobeying God". Our old friend David Nutt was talking a lot of sense about 'Ecstasy deaths' in the Guardian yesterday (I apply scare quotes because, as he points out, the recent spate of deaths were actually due to the consumption of the MDMA substitute PMA). In an unlikely marriage, the compound was created by the drug designer behind mephedrone, a now widely banned substance that has caused at least one death and been implicated in 13 others in the UK. The man, who has asked to be referred to by his pseudonym, Dr Z, initially intended his creation to be sold as a legal high. But after having discussions with Nutt and trying it on himself, he now plans to gift the patent to Nutt's charitable research group DrugScience, in the hope it will be used as a "binge mitigation agent". How it might finally be used will depend on the results of detailed testing – including how quickly it is absorbed and how it mixes with alcohol. But it might become something you'd take at the start of a night out, or perhaps even add to each drink. Nutt and Dr Z have called the new drug "chaperon". Its less catchy name is MEAI or 5-methoxy-2-aminoindane. Structurally, it is closely related to two drugs you can buy as a legal high in some places – MDAI and MMAI. Both were invented by David Nichols from Purdue University in West Lafayette, Indiana, and have some of ecstasy's euphoric effects. Nichols says chaperon also looks a bit like another drug, PMA, which is known to be highly toxic. I admire Nutt's audacity, but does he really think that this drug will not be banned at the first opportunity? Along with hundreds of similar substances, the three drugs that it has been compared to—MDAI, MMAI and PMA—have all been banned, and the latter is genuinely dangerous. As a harm reduction agent, it leaves a lot to be desired. It is well known that mixing drink with drugs significantly increases the risk of drug use and yet the whole point of this drug is that it is supposed to be mixed with drink. It also appears to be slow-acting ("more than 5 hours after the first dose, I feel intense but controlled euphoria. Now the idea of drinking alcohol seems repulsive") thus giving people more time to (a) drink and (b) take more pills because, as Nutt says of PMA, "they think they have been sold a weak lot and may take another dose to make up for this". On the other hand, 'Chaperon' may have some positive features. According to the New Scientist reviewer, it is "a party drug without some of the side effects" and there is talk of "an antidote so you can drive home after a night out." These are nice features for a recreational drug to have, but it remains a recreational drug and Nutt cannot have failed to notice that the government would prefer people not to take recreational drugs. Nutt's marketing strategy is to claim that Chaperon is a "binge-drinking mitigation agent" which turns people off alcohol, but the same could be said of amphetamines and many other drugs that have been banned for decades. Yes, drugs can be substitutes for drink as well as complements to drink, but Nutt's legal high is not as unique as he thinks it is and even if it were, it is very doubtful whether regulators would welcome another intoxicant on the market. Nutt is betting the farm on the government being more concerned about binge-drinking than recreational drug use. I strongly suspect that he is wrong. He may be able to call in some favours from his former colleagues at the Advisory Council on the Misuse of Drugs, but having a business partner who sounds like a James Bond villain doesn't help matters. I watched a documentary about 'Dr Z' once. He makes minor changes to the chemical structure of drugs, tests them on himself and then puts them on the market and waits for them to be banned (they are always banned). He invented mephedrone (AKA 'miaow miaow'), a substance which created the biggest moral panic of the last ten years. Nutt and Dr Z would make quite a pairing on Dragon's Den. "Good afternoon. I'm Professor Nutt. I was sacked by the government for being too pro-drugs and this is my business partner Dr Z, the anonymous inventor of dozens of banned substances. We're looking for £100,000 to kickstart our legal high binge-drinking mitigation business." I genuinely wish Professor Nutt well with this project. If nothing else, the inevitable banning of Chaperon will draw attention to the the absurdity of Britain's drug laws. If it is an elaborate stunt then more power to his elbow, but if he sincerely thinks that he has found a business opportunity he needs to stop getting high on his own supply. A study by researchers at Leeds Beckett University has found there is no link between the food environment and childhood obesity. 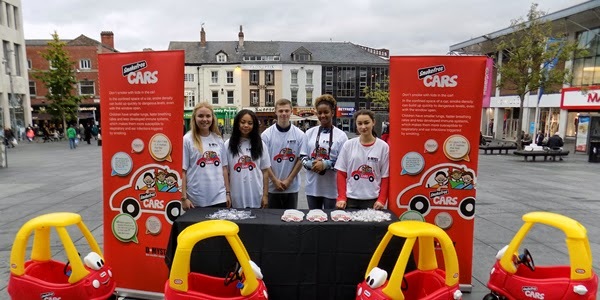 The research study, led by Leeds Beckett childhood obesity expert Dr Claire Griffiths, measured the exposure of over 13,000 children in Leeds to supermarkets, takeaways and retail outlets in three relevant environments – their home, their school and their commuting route. These environments were then used to estimate the association between the food environment and the child’s weight status. Results from the study, published today in the International Journal of Behavioural Nutrition and Physical Activity, revealed that there was no evidence of an association between the number or type of food outlets and childhood obesity in any of these environments. Additionally, there was no evidence of an association between the proximity to the nearest food outlet from the home or school and childhood obesity. This rather puts the dampeners on the availability hypothesis which the anti-obesity industry has borrowed from the temperance lobby. Local authorities up and down the country are busy preventing chip shops and McDonalds opening up in the name of 'public health'. You'd think local councillors would want to hear what the evidence says, and yet I can't find this study mentioned by any news source. Contrast this media silence with the publicity that was aroused when a study found that inner kids were "exposed" to a terrifying number of fast food outlets (ignoring the fact that the kids who ate in them most often were less likely yo be obese). Or compare it to the publicity generated by a researcher who called for a "takeaway clampdown" (although even the BBC conceded that "research on schoolchildren indicated children in neighbourhoods with a lot of fast-food restaurants were slimmer"). It's not as if the Leeds research is the final word on the matter, but there is - to put it mildly - an imbalance in the way the 'obesogenic environment' theory is reported. In some respects, it is surprising that this study has made such a big splash. It does not claim that all cancers are due to bad luck. On the contrary, it attributes a substantial minority to lifestyle factors such as smoking. Did people really think that most or all cancers are due to bad habits? Perhaps they did, but if the findings seem counterintuitive it is because of the lingering, primitive belief that ill health is the result of sinfulness and that those who develop cancer somehow deserve it—a belief that is eagerly fostered by the neo-puritans of 'public health'. I got a sense of déja vu when I read this story as it seemed remarkably similar to a story that came out only last week. This is really just another way of imparting the same information. 'Large minority of cancers caused by lifestyle factors' is no different to 'Most cancers not caused by lifestyle factors' except in its emphasis, as I said at the time. 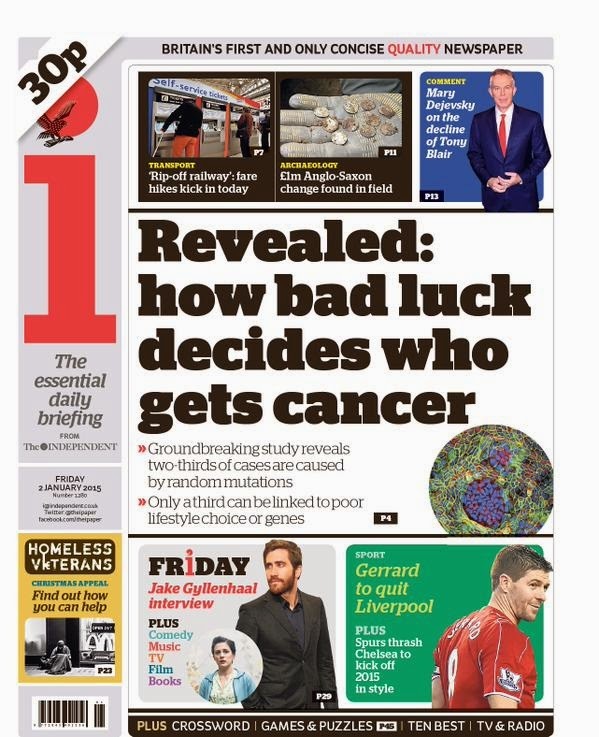 @danmacdonald73 "Most cancers are due to bad luck, doctors admit. Eat, drink and be merry." But the change in emphasis is very significant. The Boxing Day story was inspired on a Cancer Research UK press release whereas today's report is based on a study published in Science. Moreover, the CR-UK press release gives a much higher estimate of how many cancers are lifestyle related. It attributes more than 40 per cent to lifestyle factors (smoking, diet and drinking, mostly) whereas the new study finds that only a third of cancers are due to lifestyle factors, environmental factors and hereditary factors combined. And whereas the Science study is a serious piece of research written by two oncologists and published in a peer-reviewed journal, the CR-UK press release was based on a back on the envelope estimate by CR-UK statisticians and appeared to have been designed primarily to give CR-UK an excuse to promote 'standardised' packaging and assure the public that 'we do not want to ban mince pies'. It may be a coincidence, of course, but it makes you wonder whether CR-UK decided to put their figures out last week, with a heavy emphasis on things that can be banned, because they knew that the more circumspect Science study was coming out seven days later.